The Holyoke-French House is a historical house at Elm Street and Topsfield Road in Boxford, Massachusetts. 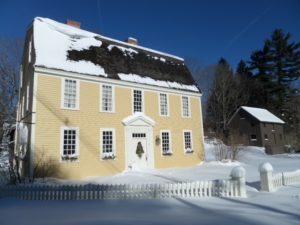 It is a 2-1/2 story wood frame structure, with a side gable gambrel roof, twin interior chimneys, clapboard siding, and a stone foundation. The center entrance is flanked by pilasters and is topped by a transom window and a gabled pediment. The first house on this site was built circa 1704 as a parsonage for Boxford’s first preacher, Thomas Symmes. The present house was built in 1760 for the third minister, Elizur Holyoke. This house is known for two of the families that resided there, the Holyokes and the Frenches. This house is now owned by the Boxford Historical Society and serves as an exhibit and holds some original furnishings as well as many artifacts representative of historic Boxford. The Holyoke-French house can be toured during the annual Boxford Apple Festival.